This house has without doubt, the best position of any property in Manyana and arguably one of the best along the entire South Coast. This charming older style holiday house is only 10 meters or so away from the surf break, and a 2 minute stroll to the sand. It occupies the northernmost position on the south side of Inyadda Beach, with uninterrupted views of the entire length of the beach, bushland and sand dunes to the north. 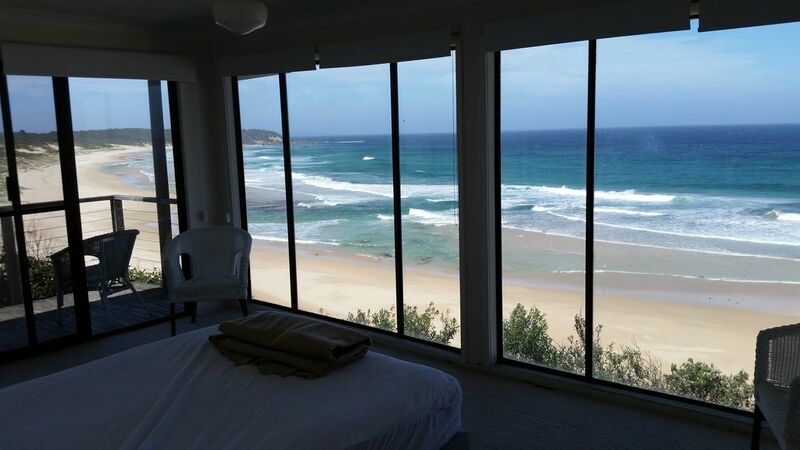 it also has incredible elevated views of the beach and ocean to the east, as well as to the southern headland of Manyana beach. On a clear day you can see all the way to the southern headland of Jervis bay. Every bedroom and all the living areas have stunning views of the beach or ocean. The house has a very private and secluded feel, nestled on a low cliff, surrounded by mature trees and bushland. You can watch the surf, the uncrowded beach, and enjoy the frequent sightings of abundant wildlife such as dolphins, whales, rare giant sea eagles, hawks, cormorants, many species of parrots and tiny native birds (honey eaters, blue wrens, and the tiny endangered bronze cuckoo) as well as the occasional kangaroo or brown possum strolling past.. The house is cool in summer due to its proximity to the ocean, benefiting from even the slightest ocean breeze on a sweltering day. Due to its unobstructed exposure to the sun from east in the morning, the north until the mid afternoon, and the west until sunset, the house is warm and cosy even on the coldest days in mid winter. There are ample large heaters for the cold winter nights. The house was constructed in the 50s with a 2nd story added in the late 70s. The house was re-partitioned, re-carpeted and repainted in the mid 90s. The open plan living and dining room has a timber floor, which is easy to clean and hard to damage, making for a worry free holiday with kids. Whilst the house has not had any major architectural upgrades and is a classic beach shack, it is basic, but clean and family friendly. There are 3 large bedrooms plus a common area with 2 single bunks, 2 bathrooms, an open plan kitchen with enough pots and pans to satisfy the family would be Masterchef, a kettle style BBQ ideal for roasting whole legs of lamb or large fish, a large timber dining table to comfortably seat 10, as well as an open plan lounge/dining area, with 2 comfortable, chocolate coloured suede lounges, which are stain resistant and easy to keep clean. The 2 queen beds and 1 king size bed(one in each bedroom) are all of a high quality. There are also 2 single bunks in the large upstairs bedroom together with the king size bed plus another 2 single bunks in a common area in between the upstairs bathroom and the other bedrooms. The house can comfortably accommodate 2 couples with up to 5 or 6 children or up to 3 couples and 4 singles. This configuration makes it an extremely flexible and affordable holiday option in one of the most sought after seaside locations. Manyana is a delightful South Coast township located less than 3 hours from both Sydney and Canberra. Additionally, there is a choice of 4 beaches/surfing breaks all within 5 minute drive including the world famous Green Island point break and the breaks on Monument Beach and Flat Rock, which are protected from the southerly wind and offer a great surfing option when the swell is too big on the South facing beaches. There are also still water options at Washers Womans Beach and the Boat Ramp, more suitable for the family and small children. No matter in which direction the wind is blowing, a sheltered beach can be found locally. There are many beach and bushwalking options including a one hour walk to Sussex Inlet, swimming in protected turquoise coloured inlets, snorkelling, fishing and boating on Lake Conjola or Berringer Lake, lots of great pushbike tracks etc. A short trip to Pidgeon House Mountain, located south of Ulladulla or the famous Mogo Zoo are also popular activites in the area. There are 2 local corner shops for supplies in the adjoining villages of Bendalong and Cunjurong Point for food and supplies, with Ulladulla only 25 minutes by car to access all the major shops. The historic and picturesque town of Milton is only 20 minutes away by car, and offers a variety of shopping, art galleries, organic delis and cafes, as well as a local hospital. There are many kangaroos at nearby Bendalong, as well as many species of parrot (including the magnificent King Parrot) that live in local bushland and can be seen and fed. (seed available from corner store). Local dining attractions for gourmets include Rick Stein at Bannisters, Mollymook, St Isadora's at Milton and Cupitts Winery, Ulladulla both approx 30 minutes away. There is a local minibus company in Manyana which will take you if you want to leave the car behind. There are hamburgers, brekkies and pizzas available at Bendalong and Cunjurong Pt. shops. The views from the property are simply amazing and unbeatable, plus the walk down the beach is also bonus. House could definitely use some upgrading though. Upon walking upstairs, there was a funky smell coming from the bedroom, not sure if it was the carpet or the base of the beds. It had a mouldy smell to it. More fans or an A/C perhaps could be installed as it was not pleasant waking up at 630 feeling like as if you're in a sauna even with the doors open. Had to purchase a fan to allow baby to sleep well. Curtains on the bottom floor would be nice as well, as heat was just penetrating the lounge and kitchen area making it uncomfortably hot to cook or just sit on the couch. With those two issues aside, it was overall a good stay and will certainly come back. What a fantastic experience! This house is absolutely the best location on the beach. Stunning views out to sea and along the beautiful and easy access beach. The house was comfortable and well equipped with everything we needed for a beach vacation. A great spot to get away from it all. Very easy and friendly communication with the owner. Would definitely recommend. Thumbs up from the Canadian and Australian visitors! A fabulous location, spacious accommodation, and the most amazing views! Highly recommended. very nice location. So beautiful views from all the windows. Old house though but very private. A balcony would be very nice, like the neighbours have. The lounge area needs some vanish. Such an amazing location. Unbeatable. Thanks for your kind review Oliver. I am glad you enjoyed the house, its location and it's facilities and had a great time. I’ve been asked to review this place so here you go! 1. If you are a surfer or just love ocean views - it does not get better and each room at the front of the house, including balconies blows you away! 2. The laundry list of rules and penalties , whilst understandable, is a little off putting. Summarise perhaps? Up to you. 3. The surprise cleaning fee - it was adequately explained - but the cleaners need to brush up on the washing up skills if you want to justify a fee. And provide some dishwashing tablets - it would show love! Over all - the view, the view, the view!!! The rest is secondary and I would come back. Thanks for your review Henry and glad you enjoyed the amazing location of our house and your stay with us. Thanks for having brought the handrail issue to our attention. The timber joist holding to which the handrails are fixed had worked its way loose and needed re bracing. Whilst there was no danger, it did cause the railing to be wobbly and needed attention, which was done. There is dishwasher powder provided under the sink, so I am not sure why this was either not there or overlooked. On checking with the cleaner after your check out, she confirmed that the bottle of Logix dishwash powder was under the sink. We encourage all our guests to contact us as soon as possible during their stay to bring any shortcomings or queries to our attention so that we can assist in locating things, advise a solution or ask our cleaner to attend if necessary. In regards to the cleaner’s washing up skills, it is up to the tenants to ensure the dishes are washed after every meal as this is not covered by the cleaning fee. If the dishes are not washed properly, we rely on our cleaner or the incoming tenants to make us aware so that we can take appropriate action. The detailed instructions we send to your tenants whilst appearing cumbersome, are necessary as they cover things like the need to rinse dishes before they are put in the machine as otherwise the filter will be full of food scraps and if left like this will cause all the dishes not to be clean of baked on food scraps, which is exactly the issue that I believe you refer to in your critique of the cleaner’s washing up skills. I am sorry that you were not aware of the cleaning fee when initially making the booking, however it is explained in the booking conditions that you are required to acknowledge before proceeding with the booking. As you know, when you raised this with me I actually did offer to allow you to cancel the booking if you were not happy with paying the fee, but you were happy to proceed. Our cleaner should of course have checked the dishes prior to your arrival, as it seems the previous tenant may not have read the instructions regarding the proper use of the dishwasher. It is quite a lot of work for the cleaner to check through all the dishes in the time allocated, and we do rely on guest feedback if this has been missed by the cleaner. However we need to be advised as soon as possible during the stay so we can investigate or act upon an issue.